Brittany and Joe you could not have picked a more beautiful historic location for your wedding day than the Mayhurst Inn. I hope you love reliving your day as much as I loved photographing it and telling your story. I am so thankful our paths crossed and we became friends from the first meeting in Fredericksburg to the sparkler exit you both were an absolute joy to not only work with but be around. Your entire family is the sweetest! The Mayhurst Inn is beautiful but especially gorgeous in the fall. The details at the Mayhurst Inn are so beautiful! Your smile lit up the room! Your dress from Kleinfelds NY was drop dead gorgous! Conner was such a sweet boy all day long! The best little ring barer ever! Getting in your dress for real is such a surreal moment. One you have dreamed about since you were a young girl. With the help of your sister Ashley and Laura to make sure you were in it tight! I think I remember someone putting a knee in your back to sinch the lacing tight lol and you saying…that’s good I can’t breath LOL. You were simply stunning! I love first looks and I can not lie, but when they include an old barn and pretty light it makes it all the more lovely! They got married under a tree that is over 100 years old! And it has a HEART in the trunk! How cute is Conner in his wagon? I LOVE LOVE LOVE when both mom and dad walk brides down the isle, I mean they both are giving her away so why not both walk her down? What better than the tree you are getting married under having a heart in the trunk! I LOVED this part of the ceremony…just as it was getting started the Rabi tied the rings in a ribbon and they were passed through the entire congregation of guests for them to lay hands on them and say a blessing over them and they were back up front by the time they were ready for the ring ceremony. Brittany is an attorney for the deaf and hard of hearing. A few of their guests a one in their wedding party members were hearing impaired so they had a sign language translator there for them! How awesome are they?? The rings being blessed by family and finally their little one Conner. The pre kiss…then the KISS! Conner was such a wonderful baby all day..and even got to dance with mommy and daddy. Shew….these moments get me every single time. I love taking my couples out for signature night portraits, they always ask me for them and it’s a fun way to steal another couple of moments alone with the one you love. The party kicked off with some guests taking the mic and getting the party rolling!!! And boy did it roll from then to the last dance! Brittany and Joe, it was such an honor and so much fun to capture your day! You have such a wonderful and fun group of family and friends! I know you will always remember this day…as the BEST DAY EVER! Thank you for letting me be a part of your family for the day. All the wonderful people and vendors who made Brittany and Joe’s day AMAZING! I thought I’d do something a little different in this blog, so I asked the bride a few questions after her wedding day to get feedback on her day. 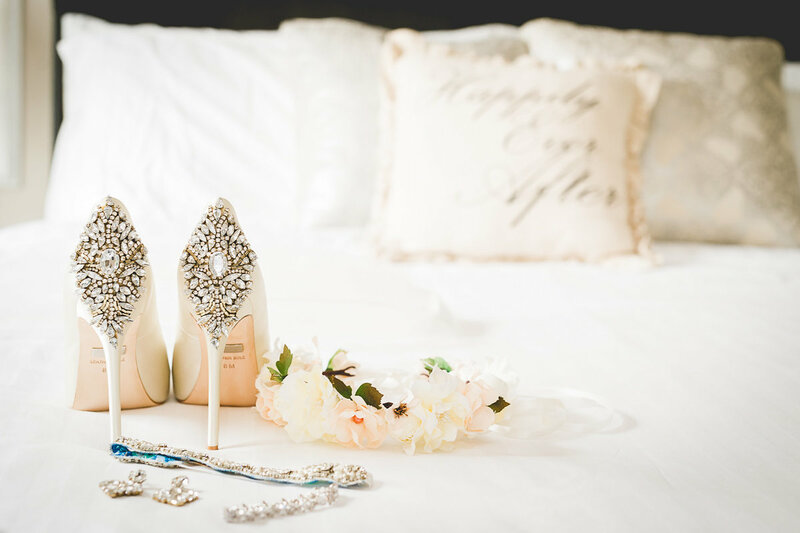 Sometimes future brides need these little bits of information to help them along the way. What was the one thing you were really looking forward to on your wedding day?Only one thing…that’s really difficult. I was so looking forward to seeing the look on Joe’s face when he saw Conner in my childhood RadioFlyer wagon with the signs I got on Etsy reading “Daddy here comes Mommy”. And I was really looking forward to the look on Joe’s face when he saw me in my dress for the first time. Of course, I was most looking forward to being there with friends and family and marrying Joe (and finally hearing his vows)! What was the most memorable moment of your wedding day?Joe’s vows – he’s usually a more of a show than tell type of person and it was great to hear him put into words his feelings. If you could do it all over is there anything you would change anything? I would worry less. And I would get heaters! I wish that the tent rental company had told me that was an option. I loved having my wedding outside at the beautiful Mayhurst Inn, but I know the guests were chilly. What was the most fun memory or moment?Joe was goofing of the entire time we were trying to take pictures, so there were a lot of fun moments! But, one hilarious moment that I won’t forget is my sisters rushing up to me and telling me a story about something the videographer was trying to get them to do for the video. And the funny part is, the videographer actually captured the conversation (without sound) on the video – I’m sure he had no idea what he was watching – but the faces everyone was making were priceless. Also, there is a progression of pictures with me, Joe, and my sisters in which my sisters are giving Joe and look and eventually you can see him catch on and start making faces back at them. If you could give any advice to a newly engaged couple about wedding planning what would it be? Do it your way. When it comes down to it, the day is about you and your love for each other. So many people will want to give you tips and advice and input. Do what makes you happy. Invite the family and friends that make you happy. Don’t invite the ones who don’t. Spend the money to do it the way you want, but also remember its one day and you have the rest of your lives together ahead of you. Worry less. There will always be something that pops up at the last minute (or a million somethings), but at the end of the day, you are marrying your person and your day will be perfect because at the end of it, you will be together. Lets talk about your wedding day too!